A leading human rights lawyer, jailed for helping ethnic Tartars in Crimea, has won a prestigious award organised by the Irish-based human rights group Front Line Defenders. Emil Kurbedinov was at the ceremony in Dublin's City Hall this morning to receive the top international prize of Human Rights Defender At Risk award for 2017. According to Front Line Defenders, which has its global headquarters in Blackrock in Dublin, defending human rights activists and political prisoners in Crimea is some of the most dangerous work that any lawyer can undertake. Despite those risks, Mr Kurbedinov has spent years providing emergency legal response for the Crimean Tartar minority, which it maintains has been persecuted by Russian authorities. In January of this year, Mr Kurbedinov was detained by representatives of Crimea's Centre for Counteracting Extremism while on his way to represent a client whose house had been raided by police. A district court later sentenced him to ten days in detention on a charge of "propagandising for extremist organisations". 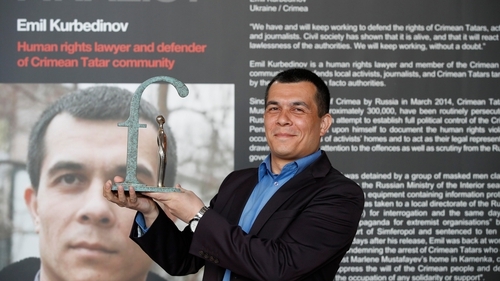 Accepting the award, Mr Kurbedinov said: "We are going against a system in which there's no hope of a fair trial. Winning an acquittal for my clients is almost impossible - but what I can do is show them that, despite the risks, I will not abandon them." Executive Director Andrew Anderson, said: "In the midst of a global crackdown on human rights defenders, the five finalists demonstrate the will to persist in the face of severe, often life-threatening risks."